These 2 types of anesthesia numb your body from the chest down to the legs. The medication is placed directly into the spine area. An area on your back above the spinal cord will be cleaned. A local anesthetic will be injected into the skin to numb the area. This is to decrease pain from the larger needle that will be put in your back. If you are getting spinal anesthesia, the doctor will give you one injection. The medication will be sent directly into the sac of fluid that surrounds the spinal cord. If you are getting epidural anesthesia, it may be delivered the same way. But, if you need more than one dose, you will have a tiny, flexible tube in place just outside of the fluid sac. This allows the doctor to give you more medication if you need it. After the surgery, a bandage will be placed over the injection spot. You will stay in bed until your legs are no longer numb. Giving spinal or epidural anesthesia usually takes about 15 minutes. You will feel some pain when the needle is inserted. Your hospital stay depends on the type of surgery being done. If you received epidural anesthesia, the tube may be left in place to give you more medication. When you no longer need pain control, the tube will be removed. 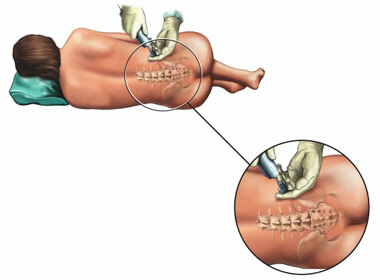 Epidural anesthesia. Baylor College of Medicine website. Available at: https://www.bcm.edu/healthcare/care-centers/anesthesiology/for-patients/epidural-analgesia. Updated August 2010. Accessed October 2, 2017. Spinal anesthesia simulation. University of Florida website. Available at: http://vam.anest.ufl.edu/simulations/spinalanesthesia.php. Accessed October 2, 2017. Regional anesthesia.https://www.bcm.edu/healthcare/care-centers/anesthesiology/for-patients/regional-anesthesia. Baylor College of Medicine website. Available at: https://www.bcm.edu/healthcare/care-centers/anesthesiology/patient-information/regional-anesthesia. Updated August 2010. Accessed October 2, 2017. Spinal anaesthetic. Patient website. Available at: https://patient.info/health/spinal-anaesthetic. Updated August 17, 2017. Accessed October 2, 2017. 12/30/2011 DynaMed Plus Systematic Literature Surveillance https://www.dynamed.com/topics/dmp~AN~T130450/Epidural-analgesia-during-labor : Anim-Somuah M, Smyth RM, Jones L. Epidural versus non-epidural or no analgesia in labour. Cochrane Database Syst Rev. 2011;12:CD000331.